This famous song is actually a contemporary adaptation of another older song known as “Silati Ngaleng Koi, a nineteenth century warrior. 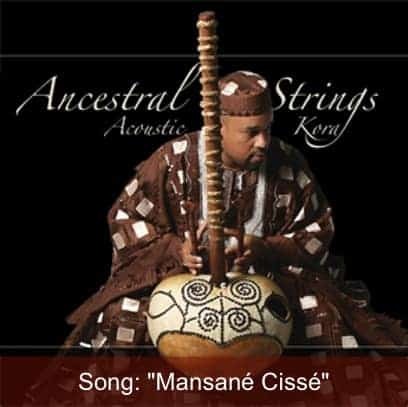 In the mid-twentieth century, Wandifeng Jobarteh composed the present words to commemorate the death of Mansane (Mandinka: “Great Lord”) Cisse. Cisse was a wealthy merchant from Bondali, a town at the mouth of Bintang Creek in the Foni Distict of the West African country of The Gambia. The story associated with the song recounts a competitative struggle for the love of a woman between Cisse and another named Bakary Nyominko. Nyominko had already sought the woman’s hand in marriage. Due to Bakary’s state of poverty, the family did not make an immediate decision. Cisse, upon learning of Bakary’s intentions immediately began showing the family with gifts and wealth. Mansane managed to influence the parent’s decision with his great wealth and political influence. Bakary was unable to compete with Mansane and sought the assistance of a local Marabout, who, by the use of gri-gri (mystical ornaments), caused Mansane to take ill the day of the wedding and die on his wedding night before the consummation of the marriage. This song is played and sung to encourage those of great means to practice humility and restraint. The tune also acts as a warning, discouraging all of us from becoming slaves to our lower nature wants and base desires.